Monday AGAIN. Which means we're back to being in a rush all. the. time. NEW BLOG design!!!!!!!!!!!!!!!!!!! So so so excited about this! I can't take any credit for it (okay, that's a lie, I picked out colors) but I'm so happy with how it turned out!! Check out all the fun clicky-things to the right! My personal trainer is the devil. I nearly puked today. Okay, I actually love her, but my legs don't right now. Style Challenge started today! Wooohooo! Stay tuned for What I Wore Wednesdays to see my outfits AND I will be linking up with some other awesome ladies from the challenge. Mini-me is sleeping again. Thank the lord! Father's day was awesome, we spoiled Mr. B. HELLO new BBQ! There may be a giveaway in the blogs near future! I LOVE Jillian!!! She's my fav!! My husband isn't so much for working out... he's naturally skinny. Bugger. Thanks! And YAY for linkups! I'm down with anything! I love your new design!!!!! First Deena, now you - I'm gettin jealous over here. Your daughter could not be any cuter! Excited for the Wednesday link up. thanks!! Erin (logo and link at the bottom of the page) helped me out A TON and it was a lot less expensive than I thought! LOVE the new design. Totes Adorbs. Pretty design - love how clean it is! My goal was pretty and simple so yay!! New design is great - so fresh and clean looking. I love how fresh it is too! Right when I clicked on it, I said, hey she got a new blog design, love it! Great job. 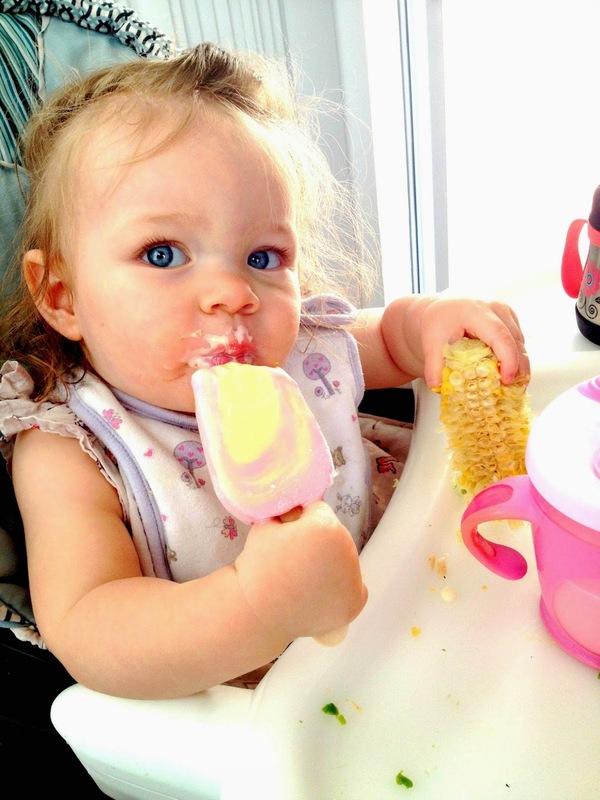 Popsicle in one hand corn in the cob in the other, so funny. Can't wait to see what your giveaway is, so fun doing them isn't it?! Well Sarah, I have you partially to thank because I got Erin's name from you!! I haven't done a giveaway yet so I'm excited!! thank you so much Erin, I'm LOVING it!